There has been a lot of attention (both from the media and investors) focused on whether E&P companies are using the right metrics in their annual incentive programs. 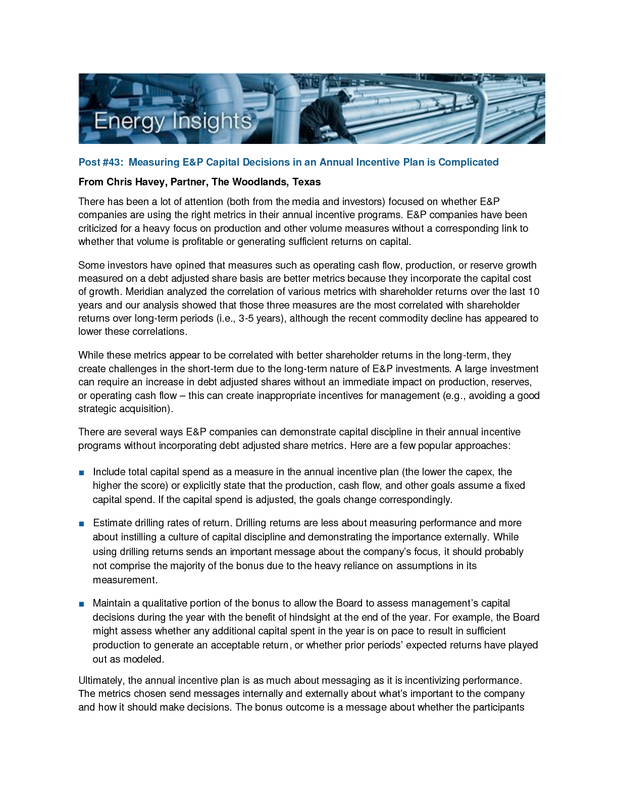 E&P companies have been criticized for a heavy focus on production and other volume measures without a corresponding link to whether that volume is profitable or generating sufficient returns on capital. 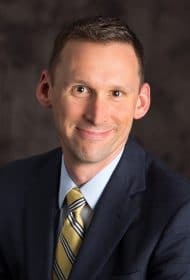 Some investors have opined that measures such as operating cash flow, production, or reserve growth measured on a debt adjusted share basis are better metrics because they incorporate the capital cost of growth. Meridian analyzed the correlation of various metrics with shareholder returns over the last 10 years and our analysis showed that those three measures are the most correlated with shareholder returns over long-term periods (i.e., 3-5 years), although the recent commodity decline has appeared to lower these correlations. While these metrics appear to be correlated with better shareholder returns in the long-term, they create challenges in the short-term due to the long-term nature of E&P investments. A large investment can require an increase in debt adjusted shares without an immediate impact on production, reserves, or operating cash flow – this can create inappropriate incentives for management (e.g., avoiding a good strategic acquisition). ■ Include total capital spend as a measure in the annual incentive plan (the lower the capex, the higher the score) or explicitly state that the production, cash flow, and other goals assume a fixed capital spend. If the capital spend is adjusted, the goals change correspondingly. ■ Estimate drilling rates of return. Drilling returns are less about measuring performance and more about instilling a culture of capital discipline and demonstrating the importance externally. While using drilling returns sends an important message about the company’s focus, it should probably not comprise the majority of the bonus due to the heavy reliance on assumptions in its measurement. ■ Maintain a qualitative portion of the bonus to allow the Board to assess management’s capital decisions during the year with the benefit of hindsight at the end of the year. For example, the Board might assess whether any additional capital spent in the year is on pace to result in sufficient production to generate an acceptable return, or whether prior periods’ expected returns have played out as modeled. Ultimately, the annual incentive plan is as much about messaging as it is incentivizing performance. The metrics chosen send messages internally and externally about what’s important to the company and how it should make decisions. The bonus outcome is a message about whether the participants met expectations for the year. Incorporating a capital metric in the incentive plan should help reinforce the practice of capital discipline internally, and quell criticism externally.